•When booked within 7 days full payment will be taken which is non-refundable. Less than 7 days of arrival date - 75% of the cost of stay. Guest’s liability for their account is not waived and guests agree to be held personally liable in the event that any indicated person, group, company or association fails to pay all or part of any charges incurred. We reserve the right to charge guests the cost of rectifying damage caused by the deliberate, negligent or reckless act of the guest to the guest house’s property or structure. Should this damage come to light after the guest has departed, we reserve the right to make a charge to the guest’s credit / debit card or send an invoice for the amount to the registered address. We will however make every effort to rectify any damage internally prior to contracting specialists to make the repairs and therefore will make every effort to keep any costs that the guest would incur to a minimum. Beaumont House Guest House operates a strict no smoking policy throughout the premises in line with UK law. Guests wishing to smoke may do so outside of the guest house. Any guest found to have been smoking inside the building (including hanging out of windows) will be asked to leave immediately without a refund. The hotel reserves the right to further charge for the cleaning of the room and loss of business for 24 hours after the guest has departed in order to clear the room of smoke before re-letting to a non-smoking guest. We reserve the right to charge guests the cost of replacing any items that are removed from the premises by them without consent. The charge will be the full replacement amount of the missing item including any carriage charges. Should the fact that the item is missing come to light after the guest has departed, we reserve the right to make a charge to the guests credit or debit card or send an invoice for the amount to the registered address. Tampering with fire detection systems and firefighting equipment. It is the guest house’s policy that all our guests have the right to be treated with dignity and respect and as a responsible host we believe that we have a duty to our guests to protect them from inappropriate behaviour. Should any actions by a guest be deemed inappropriate by the proprietor, or if any inappropriate behaviour is brought to the attention of the proprietor, the guest house reserves the right, after any allegations have been investigated, to take action against the guest. Depending on the severity of the guests’ actions the Police may become involved at the guest house’s discretion or guests may be asked to leave. Should any guest lose any belongings during their stay or incur damage to their property, the provision of the Hotel Proprietors Act 1956 will apply. If we find any lost property, we will make every reasonable effort to locate the owner and return it, but if we cannot locate the owner and an item is not reclaimed with the 3 months of the guest’s departure it will be disposed of by the guest house. Cash is acceptable. However, where the guest is paying in cash further proof of identity or security may be required at the guest house’s discretion. When using cash to make payment and where no prior booking has been made or security details taken, some form of ID and security must be produced upon check in. Payment is due upon checking in to the guest house, unless the booking has been made online where payment was taken in advance. When booking direct with the guest house a credit or debit card number must be given. If no card number is given a deposit will be required. As for parking, we have spaces at the front of guest house which we use as a drop off for luggage, all parking on street is free.All vehicles are parked at the owners’ risk. Should any damage, loss or incident occur in relation to a vehicle at the front of the guest house we cannot accept any liability. The guest house is exclusively for adults only.Children under 16 years old cannot be accommodated. Any such booking which does not follow this policy, upon arrival, will be cancelled and the booking will be charged in full. 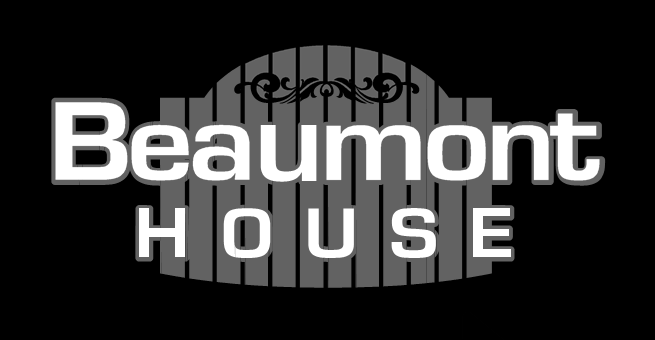 The Beaumont House is exclusively for adults.We aim to cater for the needs of all our visitors in our family owned eight en-suite bed roomed guest house. The following statement is a summary of our provisions.If you have any specific requests or questions that you would like to discuss please call or email and we will endeavour to help. There is a bus stop one road behind the property, approximately 5 minutes walk. The main train station is 5 minutes away by car. There is a local taxi service that has accessible taxis if required;we can make a booking for you. Confirmation and menus can be provided in large print by prior arrangement. There are no designated parking bays but there is free parking on the road outside. The front surface is tarmac and level and is fully lit at night. Local amenities and attractions are a few minutes from the Guest House. There is a level walkway up to the front door. The front door has two steps, the first 14cm high and the second 18cm high. The front door is always locked but we do have two bells to the left of the door at 153cm if required. The door is 77cm wide with two metal grab rails at either side. Full access with own front door key at all times. On entry into our home there is a hallway 160cm by 360cm. Seating is provided in the lounge by the hallway. Public areas have a good colour contrast and are well lit. The restaurant, bar, lounge and one double bedroom are on the ground floor. There are 19 steps to the first floor followed by a further 16 steps to the second floor. The stairs are 17cm high, 25cm deep and 81cm wide. Breakfast is served in the dining room on the ground floor. There are no steps. Furniture is flexible and can be moved on request. Tables have under-space of 64.5cm high by 104.5cm wide and height of 74cm (legs on each corner). All chairs are without arms. There are 8 en-suite rooms.The one on the ground floor has a door width of 70.5cm and there is no public WC available. All bedrooms are lockable with a key. Each bedroom has a main ceiling light, controllable from the door.There are also bedside lamps at the side of the bed. The duvets and pillows are Egyptian cotton linen, made of synthetic filling, suitable for people with allergies. There are hairdryers, clock radios and kettles in each room. Each bedroom is supplied with a well stocked beverage tray.Please advise if you wish for any of this to be removed before your arrival. Free Wi-Fi Broadband throughout the guest house. We are able to use the front and back doors in the need of evacuation;the fire alarm rings continuously if evacuation is needed. If you require more assistance for evacuating please notify us on arrival and we will ensure you are evacuated safely e.g. hearing impairment. We are happy to take delivery of hired equipment (please let us know if ordered). We supply a small drinks fridge in some of our bedrooms, which can be used for medication/food, and we can put larger items in our main fridge on request (not accessible 24 hours). People with severe nut and dairy product allergies should be aware that we do use these products in the kitchen. We are happy to supply other food or drink products (such as soya milk, decaffeinated tea or coffee) on request. Hours of Operation – Open all year.Hours, flexible to business, the guest house is our home therefore is occupied 24 hours. We have no major plans to redesign the guest house. We will be making small improvements, however these will not disturb any guests. We welcome your feedback to help us continually improve, if you have any comments please contact us.